Mexican officials have aided a "Holy Week" caravan of over 1,000 migrants headed to the U.S. border to demand Easter asylum, according to reports. 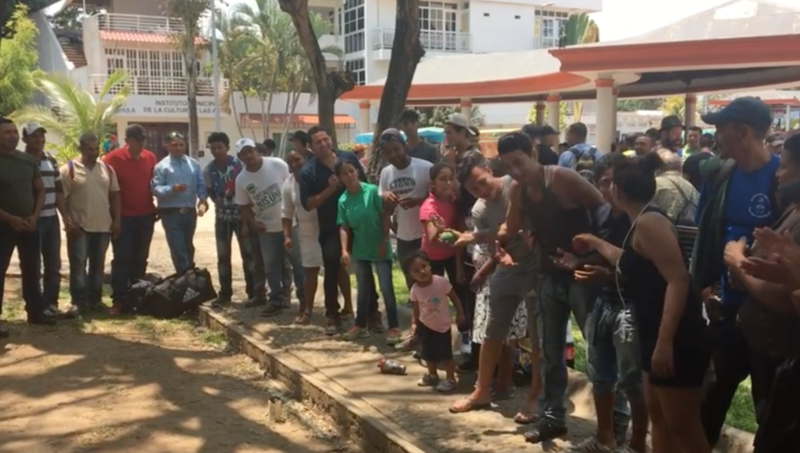 Mostly Hondurans, they posted celebration videos on Facebook and chanted "We are migrants. We are not criminals. We are workers." Researcher Kausha Luna added that the group Pueblo Sin Fronteras, which aids immigrants, bragged about speeding into Mexico. It said, “On Monday Pueblo Sin Fronteras posted a video with the caption, ‘The Refugee Caravan knocking down borders yesterday in Huehuetan! Immigration agents abandoned the post when they saw us coming. The people celebrate this first small victory!" Locals have also provided supplies along the way. Their goal is to cross into the U.S. this weekend and demand asylum. But they have also prepared special security measures should something go wrong, according to Luna. “Additionally, the group practiced security protocols, including formations which called for the men of the group to form a wall around the women and children. Moreover, the Central Americans made their way to Mexico's Commission for Refugee Assistance and made calls for better compliance with international and national laws, faster processing of asylum applications, and an increase in acceptance rates,” she wrote.